this was my baby holly. June 10, 2004...rest in peace baby girl. well, the goal of this website is to educate people on pygmy goats. i had a pymgy goat, holly. i got her when i was a freshman in high school. now im done with college and cant wait to get a house and have some more goats. i started doing research on them when i got holly and learned a lot. on this website, i wanted to give you guys a lot of great info and links. so, here we go. History:: Pygmy goats originated in the western part of Africa, particularily in the Cameroons. They used to be called African Pygmies. In the 1950's, pygmy goats reached zoos in Sweden and Germany. Pygmy goats were brought to the U.S. in two different groups and were sent to the Catskill Game Farm in New York and the Oakland Zoo in California in 1959. Description:: The pygmy goat is described as compact, unusual, gregarious, domestic, hardy, alert, good-natured, friendly, easily handled, animated, adaptable, and responsive. 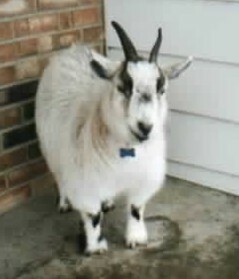 Pygmies are great pets for 4-H. Make sure you have a companion for your goat though!! Mating and Reproduction:: Goats are seasonal breeders. Breeding sesason is usually late August to middle March. The gestation period for a pygmy is 5 months. Pygmies bear one to four young every 9 to 12 months. Usually only one kid is born the first time a doe is bred. Male goats are sexually mature at about four months and females at six months, but the females are usually not bred until they are a year old. You must keep the females seperated from the males if you do not want them to become pregnant too soon. Doe kids are able to come into heat as early as 6 weeks old, and when they come into heat they are fertile. You must take the necessary precautions to make sure the kids do not become pregnant too soon. The kids weigh about 4 pounds at birth. After the doe gives birth, the kid's umbilical cord should be treated with iodine and they should be nursed. The kids need to recieve colostrum as soon as possible after the birth, and for two days after that. Colostrum provides antibodies which give the kid resistance to diseases and it aids in cleaning the digestive residue from the kid. But be sure not to overfeed the colostrum because it can cause scours. It can be saved for a later date. You may bottle raise kids too to try to keep them more docile, but some people object to this because they dont think it is necessary. The kids must also have exercise and sunshine. If you milk the doe, you want to give it a dry period of 6 weeks to 2 months to allow the mammary system have time to repair and regenerate tissue and gain new stimulation for lactation following the kidding. To dry the doe means to stop milking it, unless the doe produces a lot of milk, then milk it every few days. Feed the doe well during the dry period. Life Span:: The usual life span of a pygmy goat is about eight to ten years. Purposes:: Pygmies are primarily raised for pets, 4H projects, and milk. Pygmy goats are also sometimes raised for meat. boo to that!!! Not pygmies, but angora goats are used for mohair, which is a fabric or yarn made wholly or in part of the long silky hair. Housing:: Goats housing should defenitly have shelter because they hate to be out in the rain/snow. They should also be able to roam around a bit outside for exercise and fun. Things to climb on would be nice since they like to be up high. Pygmies shouldn't really be housed alone since they are gregarious creatures and like to be around other animals and people. Toys like balls and such are great for the goats to play with. Hooves:: Goats are even-toed hoofed mammals. Goats hooves should be trimmed every 6-8 weeks. They grow rapidly, so if they are not, they could become severely infected, bent, or cracked if not treated properly. You trim them by cutting off the dead, curled under hoof. Horns:: If you are going to dehorn your goat, you need to do it at a few weeks old, because if you dont and want to do it later, it requires surgery and can be very dangerous and painful to your goat. Feeding:: Goats need energy, proteins, minerals, vitamins, and water as their nutritive requirements. Energy determines the productivity of your goats. Energy deficiency retard skid growth, delays puberty, reduces fertility, and depresses milk production. Proteins are needed in a goats feed for cell repair and synthetic processes. Protein requirements are considered for maintence, growth, pregnancy, lactatin, activity, and fiber production. Seven macrominerals and nine mincrominerals are considered dietary essentials for livestock. The macrominerals that must be fed in relatively large amounts are calcium, sodium, phosphorus, chlorine, sulfur, potassium, and magnesium. The microminerals that must be fed in small amounts are iodine, iron, copper, manganese, cobalt, molybdenum, zinc, selenium, and flourine. Make sure your goat has enough vitamins. Vitamins of main concern usually are A and D. Water intake must exceed milk production. Your goat should be given clean water whenever they want it. 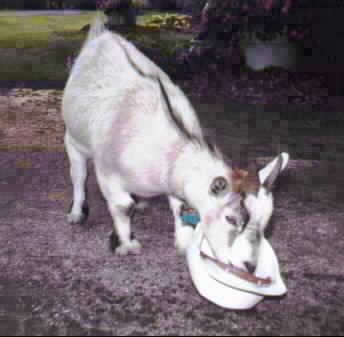 Goats usually prefer warm water. Make sure your pygmies gets good alfalfa hay to eat since they are a ruminant and need that forage. You can also give your pygmies baking soda, free choice, which helps with their rumen. To aid in digestion and give your pygmies a softer coat, give them BOSS, black oil sunflower seeds. You can find these in the wild bird feed section at wal-marts or pet stores. Don't overdo it though. BOSS is fatty. Some people opt to give apple cider vinegar to get their goats to drink more water or even get those one-a-day or flinstone vitamins for kids and give them as a supplement. Give your goat only a small amount of feed every day. About 1/4 of a cup is sufficient. Too much feed is not good because feed is just a filler and does not give a whole lot of nutrients. Bucks:: Bucks have a strong odor due to the scent gland males have around the base of each horn. Also, they pee on themselves to attract the ladies. Thier scent is not as strong in the summer when they are shedding. If you are getting a male pygmy for a pet, people usually prefer a wether because they are more gentle and do not have an odor as bucks do. If you have only one buck, it is a good idea to get a wether to keep in the same pen as company. Wethers:: Wethers are very good pets. They are lovable towards humans and are great companions for bucks or does who need to be separated for breeding purposes. Understanding Ruminants:: Ruminants are animals that have a four compartment stomach. The four parts are the rumen, reticulem, omasum, and abomasum. The rumen contains bacteria, or microbial bugs, rather than acid, to break down the food which is fats, starches, and proteins. The omasum removes water and breaks down any left over coarse particles while the abomasum, the "true stomach," secretes digestive juices. Ruminants basically swallow their food whole. It is important that they are really never "hungry" because then they have nothing to digest. Goats do not have top teeth, but a hard pallate on top rather. click on holly, my pygmy, to go to a great page full of links!! if there is anything wrong with this page, like the links or something. please tell me. also, please e-mail me if this is too hard to read for you. then, ill change the background, font, or text/link colors. thanks. i am part of a couple of yahoo groups on goat, but the best one ive been on is http://groups.yahoo.com/group/PygmyGoatPyn If you are planning on getting a pygmy goat, I highly recommend you join this yahoo group. This Pygmy Goat Webring site is owned by pygmy goats rock!! [ Previous 5 Sites | Skip Previous | Previous | Next ] Want to join The Pygmy Goat Webring?